Yep, that’s right, curly ficelles! That’s what I got for not paying attention! Since we are trying to eat more whole grains daily, I hadn’t made our favorite baguette recipe (Nancy Silverton’s in Breads from La Brea Bakery) in quite a while when I suddenly got the urge. Unborn baguettes were calling to me from the bag of flour (just as a slab of marble calls to a sculptor, they say) and I simply had to help them out. But I set my conditions. First, I would modify the recipe and use 30% white whole wheat (to make the bread more nutritious). 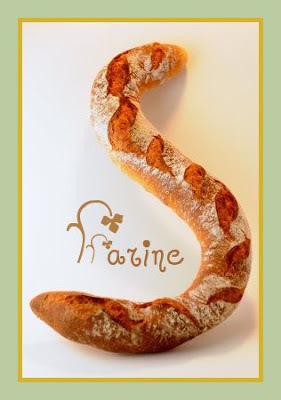 Second, I would make ficelles and not baguettes as the latter are more propitious to undesirable girth expansion (ficelle means “string” in French and a ficelle is basically a skinny baguette). Eating skinny keeps you skinny, everybody knows that! So I made the dough. The mixing was uneventful. I didn’t even have to add more water (which I thought I might have to do since I was using whole wheat). The dough was supple and slightly tacky. It smelled delicious, as usual. I set it to rise for a while on the counter then I retarded it in the refrigerator overnight. First thing upon getting up in the morning I got it out of the refrigerator (it had risen very nicely during the night) and I set it on the counter to lose some of the chill. Then I preshaped the ficelles into rough cylinders (for baguettes I would divide the dough in four pieces, for ficelles I divided it in eight). Twenty minutes later or so, I started rolling out the ficelles. The dough smelled heavenly. Working it was like letting a genie out of a bottle. I was transported back to my baguette days at SFBI this winter. I could see Frank teaching us how to shape a proper baguette, feel the heat of the big ovens, hear the rumbling of eager stomachs. I folded and refolded and squeezed and pinched and rolled, rolled, rolled. The ficelles were coming to life under my fingers, basically shaping themselves, jumping onto the flour-dusted couches and begging to go proof until they were ready to dance into the oven. So I obliged them. I shaped eight beautiful ficelles while the oven was heating up. And the ficelles rose on the kitchen table inside two big plastic bags and then the oven was hot and I poured water in the waiting metal pan and I dusted the ficelles with flour and scored them and the first batch was going into the oven when I realized…oh no! that I had made them the size we had been taught to make at SFBI and most definitely NOT the size of my oven! They came out crunchy, tasty and healthful but in a bakery environment, it would have been a hard sell to pass them off as regular ficelles! I have been making loaves of bread to the size of my baking stone/oven for close to 20 years without this ever happening… Tell me the truth, is it age? If you have the Silverton book, please note that the recipe is the one for Country White, albeit with 26% whole wheat flour instead of all white. It can be mixed by hand, in a bread machine or with a stand mixer. I used my old stand mixer with the dough hook. Remove to a cooling rack and enjoy with your favorite pâté, cheese, jam or honey! These curly ficelles have been submitted to Susan, from Wild Yeast, for her weekly Yeastpotting feature. Yeastspotting turns one this Thursday. 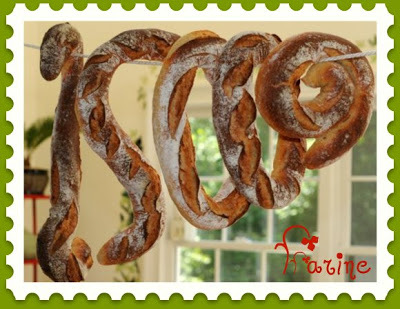 Thank you, Susan, for being such a gracious host to all of us bakers and for inspiring us with your beautiful, fun and instructive blog. Happy Birthday, Yeastspotting! MC, the first thing I thought when I saw the photo of your curly ficelles was that you had spelled out a word. 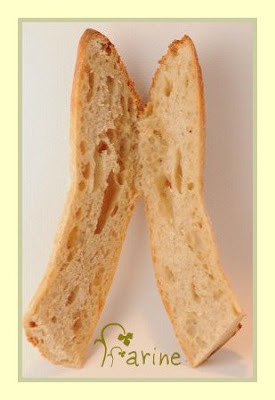 If you had curled the ficelles to spell the word "Bread", no one would have thought that an error had been made! Well seen! Unfortunately, at the time, I had my head in the oven trying frantically to rescue these poor ficelles and it didn't occur to me to try to write with them! 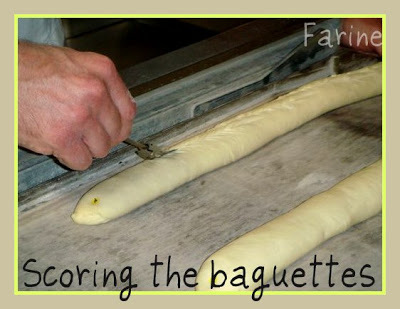 I always have the same problem, ovens aren't made for baguettes, so usually I make demi or mini bags or ficelle! Though the other day I made 280g poolish baguettes and I had a curly end, still tasted good, beautiful crumb, ugly shape! What hydration was the starter? MC, you may have started a trend here! These definitely look like a party to me. If you hadn't told the story we would have thought you planned them that way. Thank you so much for your kind words and warm wishes!